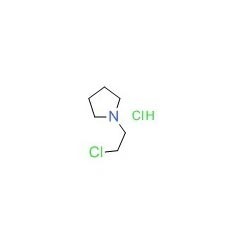 We are successfully ranked as the top manufacturer, exporter and supplier of 2-Chloroethylpyrrolidine Hydrochloride. This product is processed using excellent quality ingredients in adherence to international quality standards under the supervision of our experienced professionals at our advanced process lab, which is equipped with all the required machinery and tools. Our quality controllers also examine this product to make sure that it is free from flaws. Incepted in the year 2011, at Pune (Maharashtra, India), we “Synecos Organics Pvt. Ltd.”, is positioned amidst the foremost manufacturer, supplier and exporter of an extremely useful collection of Nipecotic Acids,Tert-Butyl Glycinate, Heptane Dihydrobromide, (1s,4s)-2,5-Diazabicyclo [2.2.1] Heptane Dihydrobromide, etc. These are formulated using top notch quality chemical compounds and other ingredients sourced from some of the reliable vendors of the market. In addition to this, we follow all the norms of quality prescribed by the industry in the manufacturing process of the given range. Our aim is to constantly increase client base by working as per the quality oriented methods. With the support of our committed research and development team, we bring about changes in the chemical compositions of the products to make these more effective. The offered products can also be availed by clients from us in various customized packaging options as per the variegated needs of our valuable patrons. In addition to this, we are engaged in offering services related to Library Design and Synthesis. At Synecos, we have three key areas of focus - the science, the service and the people. We have assembled one of the world's most efficient and advanced series of facilities, capable of dealing with the widest range of molecules. Through the use of high tech equipment and the 'creative' use of our science, we help our clients find unique solutions to many problems that get in the way on the journey from discovery to proof of concept, often turning disasters into real milestones - which is what makes Synecos different. Our service is second-to-none. We have a determination to exceed expectations by always delivering more - attention to detail, speed and efficiency backed by a positive attitude to help us deliver a series of world class services to each and every one of our clients on a global scale. Synecos people are the best. They are carefully selected and trained; each individual has a part to play and something to offer. We nurture innovation and collaboration, our people have the experience, the know-how and a collective attitude to finding the right answer to the problem - whatever that may be. This is what makes Synecos different too.